Sad news from the online cat community. 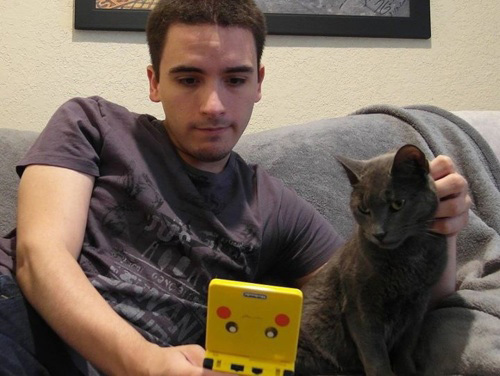 Marty, the real life Russian Blue who was the inspiration behind Nyan Cat, has died at the age of two from Feline Infectious Peritonitis (FIP), a fatal viral disease in cats that also claimed the life of budding internet video star, Choco Ball, last year. 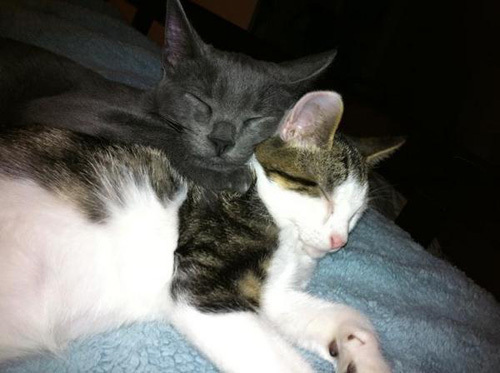 "In early December 2010, I adopted two kittens from the local shelter. After some debate on their names, I decided to go for Buster and Marty. Buster was named after Buster Bluth from "Arrested Development." Marty was named from Marty McFly from "Back to the Future." The two were inseparable. However, Buster soon became ill. It was out of nowhere but he had Feline Infectious Peritonitis. Buster passed away a year ago. Things were just fine with Marty. Vet said he was healthy, all was good. Marty heavily influenced a lot of my comics and the creation of Nyan Cat." "Last week, Marty started behaving strange. We quickly took him to the vet and he was diagnosed with Feline Infectious Peritonitis, too. Even with the medical treatment he received he still deteriorated quickly. I’ve been force feeding him and keeping him warm for three days. For a while today it looked like he was getting better, but unfortunately, at around 9pm tonight he got convulsions and passed on my arms. I was seriously hoping to nurse him back to health, but FIP is pretty much a death sentence to most cats. There is no known cure. I’m so sorry. I will really miss Marty. He was seriously just the coolest cat ever. I just couldn’t save him." Chris later thanked everyone for their condolences, tweeting, "Was surprised to find so much support and love from people all over the world. I'm glad Marty's legacy will live on. He was such a cool cat." Torres created Nyan Cat in April 2011 after being inspired by separate requests to draw a Pop Tart and a cat during a Red Cross charity drawing event. The infamous video, featuring the animated rainbow cat flying through space to the tune of "Nyanyanyanyanyanyanya" was posted on YouTube just days later, and has amassed a staggering 87 million views to date. RIP Marty. I hope you're having fun at the rainbow bridge with your friend Buster! 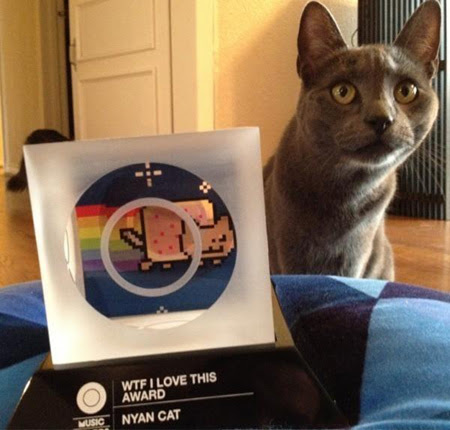 Your spirit will always live on through Nyan Cat, and you'll never be forgotten by your fans, and by your family who loved you the most. FIP is such an awful illness. So sad. So, so sad to loose one of our babies!! Extremely sad. He did have a short, yet, wonderful life -- and was deeply loved. We adopted two sisters when they were six months old and had been turned into the shelter because the owner had severe allergies. I adopted them the day they were turned in and begged the shelter to let me take them to my vet that day but they insisted in doing the surgery to fix them first and they both developed severe upper respiratory infections. Two months later one of them became ill, was diagnosed with wet FIP and died. Her sister lived to be 16 luckily but losing that kitty after just two months with us was just heartbreaking. I am so very sorry for your loss and I can tell you that I know just how terrible this is for you. But they both had great love which is the most important thing. I can't help but wonder why God created such an incredible creature for us to share our lives with, yet give them such a short life span. It's so very hard to say goodbye. For me, it's the only downside to living with kitties. I'm very sorry about your dears, but as Anonymous points out, they had warmth, love, shelter and food, which is all we ever want for these lovely beings, and so many never get that at all. I thank God for you, your love and your comfort. Oh, how I hate FIP. It took my first Aby, Gun-Hee, before his 2nd birthday. His littermate brother, Rusty, also got it within days - proof that it's genetic. His littermate brother was 1000 miles away, but the cats who lived with Gun-Hee (ranging in age from 3 to 14) were perfectly healthy. I hope we find a cure for this evil, murderous disease. Happy hunting in StarClan, Marty. we hope that Chris knows how much he was surely loved by those boys. FIP is an evil disease and we hope vets can one day figure it out. Very sad. Sorry for his loss of his beautiful kitty. I lost my kitty to this in August. Im so sorry. I know how hard it to lose a dear friend. Have fun on Rainbow Bridge, Marty! say meow to my late buddy Midnight for me...RIP Buddy.